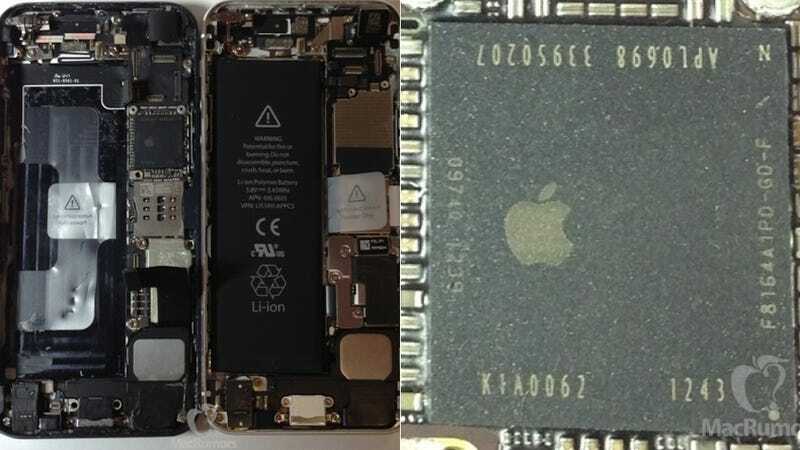 It appears that the mystery chip from last week's (purported) iPhone 5S leak is a mystery no more. Thanks to MacRumors' new—and far better—photos of the new iPhone's backend, the chips is now clearly identifiable as a an A7 chip. The original A6 chip carried a model number of APL0598, with the A6X found in the fourth-generation iPad carrying an APL5598 model number, demonstrating how Apple varies the first digit for members of a given A-series family and increments the second digit when transitioning to a new family. However, the chip's other markings tell us that although this is an upgrade, it's not a total overhaul of the A6—it appear we're still getting the same 1 GB of Elpida DRAM on the A7. Another interesting change comes in the K1A0062 identifier, which is different from the usual starting number of "N" that would signify a Samsung part. There'd been murmurings of a TSMC-made chip, and although we'd recently been led to believe that the switch wouldn't come until the A8, this certainly suggests otherwise. So while sure, that means Apple really is finally breaking away from any real dependence on Samsung, this also tells us that Apple is moving further towards fully designing its own chip from the ground up—not just customizing someone else's parts to its own needs. And thankfully, these image do seem to reconfirm that the next gen iPhone battery is at least a little bigger than what we have rapidly dying in our current phones. Plus, we've got an even clearer image of what is undoubtedly the highly coveted dual-LED flash.